It is not clear from Google how Professor Jean Seaton became official historian of the BBC. But she was appointed to that dizzying status in 2001 – and she is without doubt perfectly suited to the role. Why? Well because of her impeccable Labour credentials. What is it about the Corporation that even its mysteriously-appointed ‘official historian’ is a card-carrying Guardianista? Seaton is the widow of former Labour ‘intellectual’, MP, and historian Ben Pimlott. She is a regular contributor to the Guardian in defence of the Corporation, and she clearly believes in her many books of media analysis from her lofty role as Professor of Media Studies History at the University of Westminster that the BBC is the only bulwark against those nasty, encroaching hordes of the free-market media. She has now turned her attention to the Thatcher-era BBC. And in line with much of the central mission of the BBC itself, her primary aim in Pinkoes and Traitors – The BBC and the Nation 1974-1987 appears to be trash the reputation of the Iron Lady. And in an extract in the weekend press, she certainly delivers. This is a claws-fully-out attack from someone who clearly hates Thatcher with a vengeance and has old Kinnock-era scores to settle. The charges against her are multiple and multi-layered. Foremost, according to Seaton, she hated the BBC because it would not tell the story of the Falklands War or the battle against terrorism in Northern Ireland in the way she wanted. As a result, she was rude to BBC staff, thought the Corporation was scheming against her, and delighted in humiliating BBC interviewers. She flounced out of studios. Seaton throws in that Mrs T had the temerity to be truculent and aggressive towards BBC management figures, refused to talk properly or rationally to them, did not know what she really wanted in terms of reform, but and above all wanted her own way. Professor Seaton claims in reaching this verdict that she has talked to many BBC people and delved deep into the archives. But the conclusions are exactly what might be expected by a Labour historian of the era – so she might just as well not have bothered. There is also a glaring inconsistency in her picture. She has apparently unearthed from the archives something not previously known: that the disastrous Labour Winter of Discontent government had devised a plan to end BBC independence, replacing the licence fee with funding through general taxation. In her blind mission to rubbish Thatcher, it seems to have passed under Seaton’s radar that actually, the Labour party of Harold Wilson and his heirs was viscerally against the BBC and wanted to curb its journalism in a way that no Conservative government has ever attempted. In fact, when Thatcher was elected in May 1979, her government actually rejected the Labour plan for socialist-style state control and instead, Mrs Thatcher – despite her frequent grumpiness about BBC conduct and reporting – actually acted decisively to continue the licence fee. Subsequently, as I have written recently on TCW, she did decide the BBC needed reform through taking advertising. But it was pressures from within the Conservative party that prevented this from happening. It was 1985 before she acted on the plan by appointing the Peacock Commission – and here, she made the fatal mistake of also allowing the appointment to that body of former Guardian editor Sir Alastair Hetherington. When it finally reported, the fire had been turned decisively away from the BBC and towards reform of ITV. So Mrs Thatcher – far from wrecking the BBC – actually saved it in 1979 and was thwarted in her efforts to achieve even the most minor reform. Another part of Seaton’s analysis seriously lacks credibility. I worked at the BBC for a substantial part of this period (1978-85). Part of my role entailed regular attendance at planning and briefing meetings of the most senior BBC editors at Lime Grove and at Television Centre. I thus had a ringside seat observing the Thatcher-BBC battles that Seaton claims were dominated by Thatcher’s irrational, vicious petulance. It was a different era, and there were still vestiges of a solid, professional desire at the BBC to deliver properly balanced journalism. There was even one editor who I suspected might have voted Conservative, though he would never have had the guts to confirm it to his colleagues. But boy, did those editors hate Thatcher. And while they professed to be ‘impartial’, it seemed to me at the time and in retrospect they delighted in nothing more than when they thought they had got one up on her or her government. A main issue back then revolved round the redoubtable Sir Robin Day. In his heyday, Sir Robin had been the feared scourge of all politicians, an adroit, highly-skilled interrogator. But by the 1980s his star was beginning to fade. He told me in 1985 (for a BBC syndicated feature) that it seemed to him he had started out as Torquemada, and was now (as humble as) Uriah Heep. The BBC editors wrung their hands that Sir Robin – still their most senior political interviewer, and the one who therefore handled the key election interviews – was not skewering Thatcher. This came to a head in the famous 1983 General Election Panorama encounter when Sir Robin was clearly flustered and stung when Mrs T called him ‘Mr Day’, rather than ‘Sir Robin’ no fewer than 11 times. Behind the scenes, there was much plotting to oust him for his failure – but his reputation and track record still counted massively, and it came to nought. Now of course, it was part of the BBC’s job to attempt to skewer Maggie. But this was a disproportionate, concentrated and festering drive for vengeance. 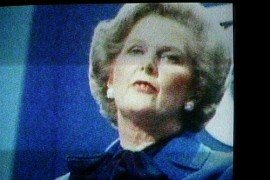 And during 1984, another crisis point was reached when the Panorama programme Maggie’s Militant Tendency – the central premise of which was that Mrs Thatcher’s Conservative party had Nazi leanings – was broadcast. I was ordered by the then DG’s office on the night of its transmission, when it became clear that some of the journalism involved was suspect, to tell the media in Watergate fashion that the Corporation ‘stands by its story’. Eventually, the programme – like so much of Seaton’s vitriol against Thatcher – was shown to be hot air, and substantial libel damages were paid to the MP Neil Hamilton. Memories are of that bitter defeat, it seems, are long: now the BBC knives are out for David Cameron – and, he like Mrs Thatcher before him, has failed to reform the Corporation. But at least the Iron Lady tried.